Another galaxy that needs no introduction, here's my most recent and best attempt at M104 to date. 7.1hrs of LRGB data captured with an 8" ONTC and QHY178M riding on a Mach 1. Full res / high quality / more capture details available on astrobin. Fantastic!!! May I ask what you use for a coma corrector? This has been my favorite since the first time I saw it in the opening and closing credits of Outer Limits. 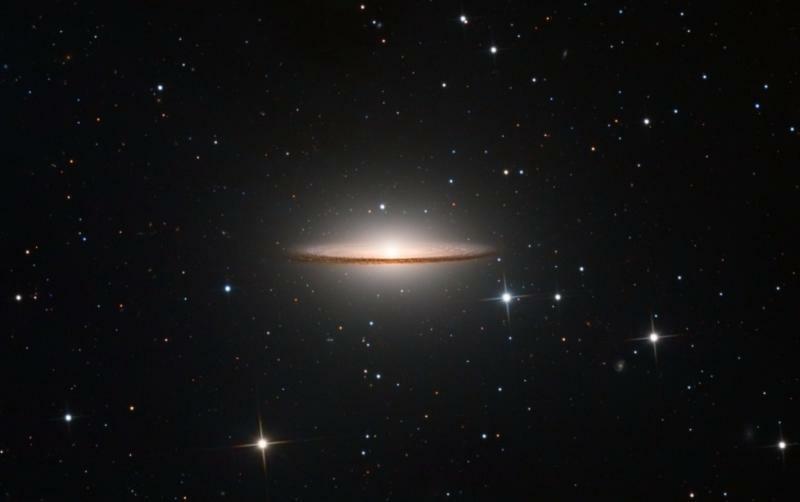 Very nice image of M104. Nice color and detail on the inside of the Galaxy. Your Sombrero is muy bueno! Beautiful image and processing. Thanks for sharing it. Another awesome image. Great job Lee! Thanks Jon That is the IMX178, but with the Paracorr it's a bit longer than 800mm. PI plate solves it at 0.5"/px, 989.39mm. I did shave a couple of hundred pixels off the image too due to poor camera rotation too, as you can see from the resolution on Astrobin. Very impressive! Even more impressive when you look with higher magnification at the image. No flaws visible for my eyes! Hi Leemr, impressive result! I like the detail on the arms. Wonderful!! That's very well done (in all respects, capture and processing). Did you measure the FWHM and eccentricity? Those numbers will obviously not affect the quality or beauty of the image, but it would be nice to know what kind of resolution you got given your optics, guiding, and seeing (the latter particularly important). So, FWHM is 2.295" on the X axis and 2.25" on the Y axis. Not the best, but pretty typical for my skies. Eccentricity was good, with an r of 0.98. My recent M83 had an L integration of 1.89" on the X and 1.82" on the Y which was nice. I've been getting some elongation which I think might be due to focuser axis alignment manifesting in astigmatism... when watching SGP do the AF routine you can see the stars go become ovals as it goes in / out of focus, switching direction either side... so when SGP doesn't nail focus (which is often, I suspect), I've been getting slight elongation. That's my theory anyway. Could also be guiding since my imaging scale is pretty challenging, even for a Mach 1. Edited by leemr, 17 April 2019 - 05:02 AM. Okay, thanks for the data. I think 2.3 arc seconds isn't that bad for luminance and it is very rare that I get FWHM measurements that are under 2 arc seconds in luminance or in a finished RGB image. H-alpha is a completely different story and I've gotten narrow-band images that are sometimes down near 1.3 arc seconds (in the finished master integration). These are all for my Tele Vue NP127is (5" refractor) when using either a Sony IMX178 or IMX183 sensor. However, on a recent trial over three nights I was able to get a completed RGB image from my 9.25" EdgeHD that came out to 1.85 arc seconds (using a one-shot-color QHY5III-178C). However, for that image I used five second exposures and ended up rejecting almost half of my subs for either star size or shape (mostly because of the seeing conditions). In this case I had a few subs that were around 1.5 arc seconds and I really don't think it is possible to do much better than that in luminance regardless of the size of your telescope (unless you image from the top of a mountain with good seeing or somewhere else that has really superb conditions -- usually when near to the ocean). In any case, I had to reject over one thousand subs to get the best fourteen hundred for the final integrated master. Interestingly enough, even the final 1.85 arc second FWHM didn't look that good but I think that is because I was using an image scale of 0.3 arc seconds per pixel and thus even these "small" stars were measuring at something around six pixels wide. Then contrast that with the two or three pixel-wide FWHM you'd get when using a shorter focus refractor at an image scale of 0.75 arc seconds per pixel but with a similar two arc second FWHM. This may be one of the reasons why a lot of users think that a refractor produces sharper looking results (it's not the optics, just the change in the image scale). Of course, you can always reduce the final image scale (i.e. make the image smaller), but since I was using the IMX178 I only had six megapixels to begin with and I was also imaging a pretty small object (M57, the Ring Nebula). Thus, the larger aperture and larger image scale didn't really do me much good even given my better than average seeing conditions (at least, better than I usually get). Many seem to wish simply for better weather (usually meaning clear skies), but I'd prefer to have one night with clear skies and good seeing over two nights (or more) with clear skies but poor seeing. In fact, in most cases I'd take better seeing over somewhat darker skies. Almost missed seeing this beautiful shot. I think the color is especially excellent. can you please give me a hint where to find this in Pixinsight?? Interesting to compare with the FWHMExcentricity! Ok, just found it, interesting script!! Edited by Mert, Yesterday, 09:56 AM.